Inconel is an austenitic nickel-chromium-based super alloy that is usually utilized in high temperature applications. It can resist corrosion and oxidation, and it is also able to retain and maintain its structural integrity in high temperature environments. Inconel is commonly used in chemical processing, nuclear power, and petrochemical facilities. Because of its toughness, Inconel is an excellent choice for sea and aerospace applications. Inconel is also a material that continues to be a great challenge in the fabricating and metal cutting industries due to its toughness. So, what makes Inconel tough to work? The answer is rapid work hardening. Inconel is a difficult metal to shape and machine using conventional methods. The strength of Inconel is derived from the stiffening effect of the molybdenum and niobium on its nickel-chromium matrix. This combination of elements is responsible for Inconel’s superior resistance to a wide range of corrosive environments, along with its high temperature resistance to things like oxidation and carbonization. The high molybdenum content also makes Inconel resistant to pitting and crevice corrosion, and the niobium acts to stabilize sensitization during welding, preventing cracks. Inconel is available in all forms including rod, bar, wire, wire rods, plate, sheet, strip, shapes, tubular products, and forging stock. Despite its toughness, a blade can cut through Inconel; a saw blade designed specifically for this type of material is the Q701 Series, M42 High Production Bi-Metal Bandsaw Blade. The Q701 uses unique tooth geometry and 8% ground Cobalt high-speed steel tooth tips designed for cutting alloys prone to work hardening. SawBlade.com made the Q701 blade extremely tough, welding it for excellent heat and wear resistance in order to lengthen blade life. It has an added durable chrome backing feature as well. It is very important that the saw blade be compatible with the material to be cut. Inconel, for instance, cannot be cut using an ordinary saw blade. Its toughness will break or destroy the blade. 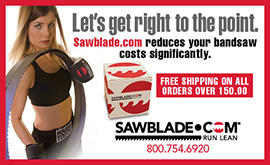 At SawBlade.com, a variety of blades for different applications is available. From mild steels to super alloys, browse the selection of blade types suitable for the type of material to be cut. This entry was posted in All Posts and tagged bandsaw machines, cutting, Inconel, machine shops, materials, saw blades, sawblade.com. Bookmark the permalink.